The Baltimore Colts were looking to wrap up a division title as they took on the Buffalo Bills on December 13, 1970. In the newly-realigned league due to the merger between the AFL and NFL, the Colts found themselves in the American Football Conference, consisting primarily of ex-AFL franchises, and were ahead in the AFC East with a 9-2-1 record. Under first-year Head Coach Don McCafferty, the Colts had hardly been dominating in compiling their record. The running game was mediocre and 37-year-old QB Johnny Unitas was past his prime, although still effective with outstanding wide receivers in Roy Jefferson and Eddie Hinton. The defense was strong, however, especially with linebackers Mike Curtis and Ted Hendricks, and at safety with Jerry Logan and Rick Volk. The Bills, coached by John Rauch, were struggling at 3-8-1 but had tied the Colts in their previous meeting. HB O.J. Simpson, the team’s rising star, went out for the year with a knee injury four weeks earlier, but rookie QB Dennis Shaw was playing well after having taken over the starting job in Week 3 and WR Marlin Briscoe was leading the conference in pass receiving. The defense was effective against the pass, but overall the team was chronically prone to penalties and turnovers. There were 34,346 fans in attendance at Buffalo’s War Memorial Stadium and the field was slippery and covered with snow. The Colts scored first, at 5:46 into the first quarter, when Jim O’Brien kicked a 32-yard field goal. Buffalo got a boost when HB Roland Moss returned the ensuing kickoff 56 yards to the Baltimore 40. Dennis Shaw completed four passes, HB Lloyd Pate scored a one-yard touchdown, and Grant Guthrie added the extra point to give the Bills a 7-3 lead. Baltimore came back with a 14-play series that was helped along by a 30-yard pass interference penalty on the defense after running eight straight times. FB Tom Nowatzke gained the last yard for a TD with seconds remaining in the opening period and O’Brien converted. In the second quarter, Buffalo put together a seven-play, 78-yard possession that led to Shaw throwing to WR Marlin Briscoe for a 10-yard touchdown. Guthrie’s successful point after provided the home team with a 14-10 lead at halftime. A key sequence in the third quarter allowed the visitors to regain the lead. The Bills were at their 23, but a holding penalty backed them up to the 11, from where they had to punt. Another penalty, this time for interfering with the fair catch, gave the Colts excellent field position at the Buffalo 33. From there, Johnny Unitas threw to Roy Jefferson for a 30-yard gain. FB Norm Bulaich powered over from three yards out for a touchdown and a fight also broke out, leading to CB Robert James of the Bills being ejected. O’Brien added the PAT to make it a three-point lead for Baltimore. Buffalo was unable to put any more points on the board in the second half as the Colts stepped up on defense. In two instances, CB Charlie Stukes (pictured below) intercepted passes by Shaw to stop drives. The Colts scored once more when O’Brien kicked a 38-yard field goal and held on to win the sloppy game by a final score of 20-14. The Bills had the edge in total yards (333 to 275) and first downs (18 to 15), with Baltimore managing just 49 rushing yards on 29 attempts. However, Buffalo turned the ball over three times, to one suffered by the Colts, and were hurt by seven penalties, totaling 103 yards, as against just one flag thrown on Baltimore. The teams combined for 15 punts (8 by the Bills, 7 for the Colts). Johnny Unitas completed 13 of 31 passes for 236 yards and no touchdowns, but also had none intercepted. WR Roy Jefferson had 5 catches for 125 yards and WR Jimmy Orr added 70 yards on his three receptions. Tom Nowatzke led what there was of a rushing attack with 20 yards on 9 carries that included a TD. Norm Bulaich was held to 18 yards on 15 attempts that also included a score. For the Bills, Dennis Shaw (pictured at left) was successful on 23 of 43 throws for 252 yards and a TD, although he gave up two interceptions. Marlin Briscoe caught 7 passes for 78 yards and a touchdown and WR Haven Moses gained 100 yards on his 6 receptions. Lloyd Pate rushed for 49 yards on 15 carries that included a TD and also had 6 catches for 29 yards. Despite clinching the division title, there was much dissatisfaction with Baltimore’s performance, especially from Coach McCafferty, who didn’t give out any game balls. Starting WR Eddie Hinton was benched in the first quarter after blowing an assignment and DB Ron Gardin saw no further action after he fumbled a punt that the Bills recovered. The mood may not have been particularly celebratory, but the Colts clinched first place in the AFC East and finished with an 11-2-1 record. Baltimore went on to win the first AFC Championship and defeated the Dallas Cowboys in the Super Bowl. Buffalo made it five straight losses to close out the season at 3-10-1 for fourth place in the division. 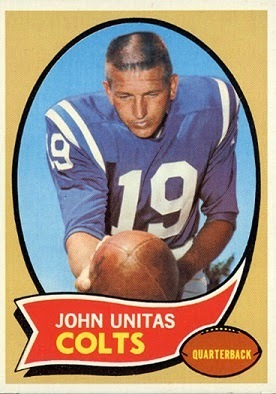 Johnny Unitas, in what proved to be his last effective season (he played for three more), threw for 2213 yards and 14 touchdowns, although with 18 interceptions. Roy Jefferson, in what was his only season in Baltimore (he was dealt to Washington the following year), caught 44 passes for a team-leading 749 yards (17.0 avg.) and seven touchdowns. 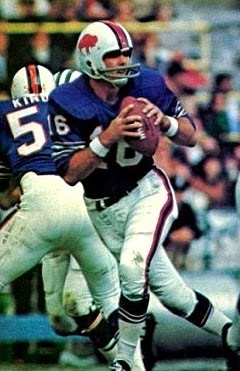 Dennis Shaw received Rookie of the Year plaudits as he placed second in the AFC in pass completions (178), yards (2507), and yards per attempt (7.8), although also in interceptions (20). 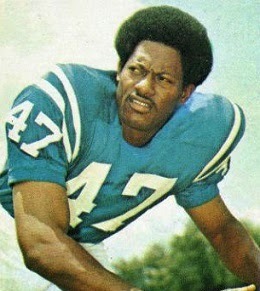 Marlin Briscoe topped the AFC with 57 catches for 1036 yards.